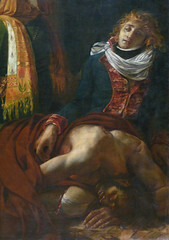 In the decades following the French Revolution and Napoleon’s final defeat at Waterloo (1815) a new movement called Romanticism began to flourish in France. If you read about Romanticism in general, you will find that it was a pan-European movement that had its roots in England in the mid-eighteenth century. Initially associated with literature and music, it was in part a response to the rationality of the Enlightenment and the transformation of everyday life brought about by the Industrial Revolution. 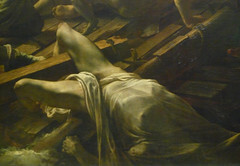 Like most forms of Romantic art, nineteenth-century French Romanticism defies easy definitions. 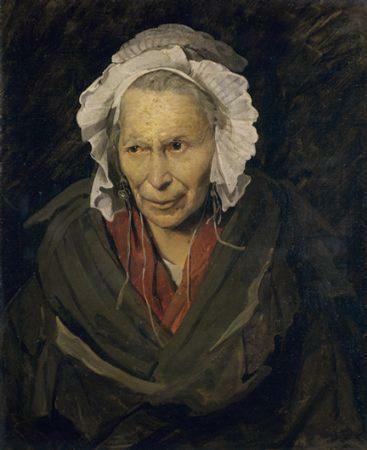 Artists explored diverse subjects and worked in varied styles so there is no single form of French Romanticism. 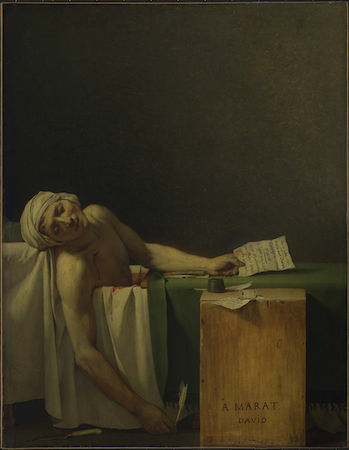 One might trace the emergence of this new Romantic art to the painting of Jacques-Louis David who expressed passion and a very personal connection to his subject in Neoclassical paintings like Oath of the Horatii and Death of Marat. 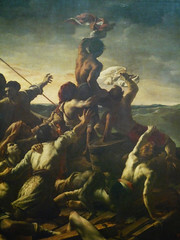 If David’s work reveals the Romantic impulse in French art early on, French Romanticism was more thoroughly developed later in the work of painters and sculptors such as Theodore Gericault, Eugène Delacroix and François Rude. The first marker of a French Romantic painting may be the facture, meaning the way the paint is handled or laid on to the canvas. 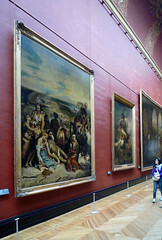 Viewed as a means of making the presence of the artist’s thoughts and emotions apparent, French Romantic paintings are often characterized by loose, flowing brushstrokes and brilliant colors in a manner that was often equated with the painterly style of the Baroque artist Rubens. In sculpture artists often used exaggerated, almost operatic, poses and groupings that implied great emotion. This approach to art, interpreted as a direct expression of the artist’s persona—or “genius”—reflected the French Romantic emphasis on unregulated passions. 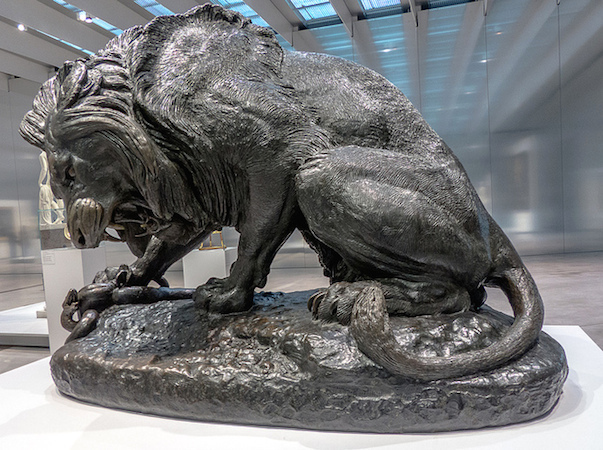 The artists employed a widely varied group of subjects including the natural world, the irrational realm of instinct and emotion, the exotic world of the “Orient” and contemporary politics. 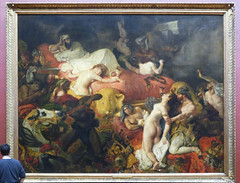 Eugène Delacroix, who once wrote in his diary “I dislike reasonable painting,” took up the English Romantic poet Lord Byron’s play Sardanapalus as the basis for his epic work Death of Sardanapalus (below) depicting an Assyrian ruler presiding over the murder of his concubines and destruction of his palace. 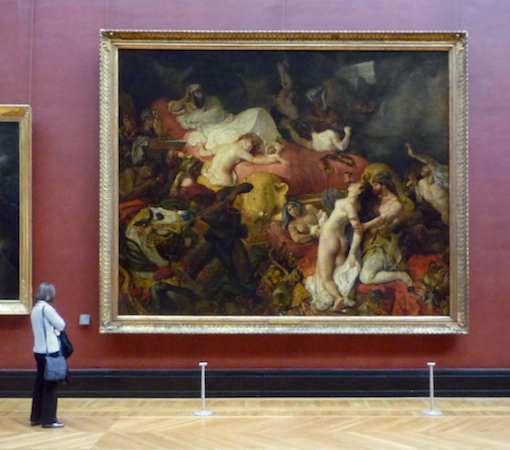 Delacroix’s swirling composition reflected the Romantic artists’ fascination with the “Orient,” meaning North Africa and the Near East—a very exotic, foreign, Islamic world ruled by untamed desires. 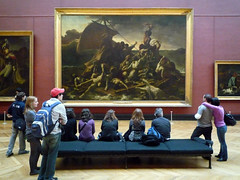 Curiously, Delacroix preferred to be called a Classicist and rejected the title of Romantic artist. 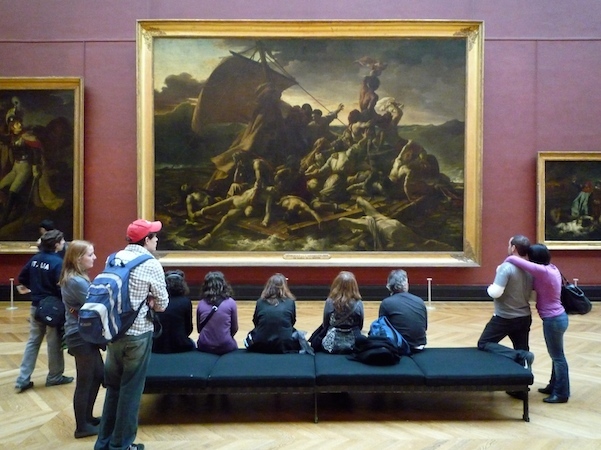 Whatever he thought of being called a Romantic artist, Delacroix brought his intense fervor to political subjects as well. 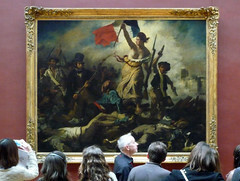 Responding to the overthrow of the Bourbon rulers in 1830, Delacroix produced Liberty Leading the People (below, 1830). 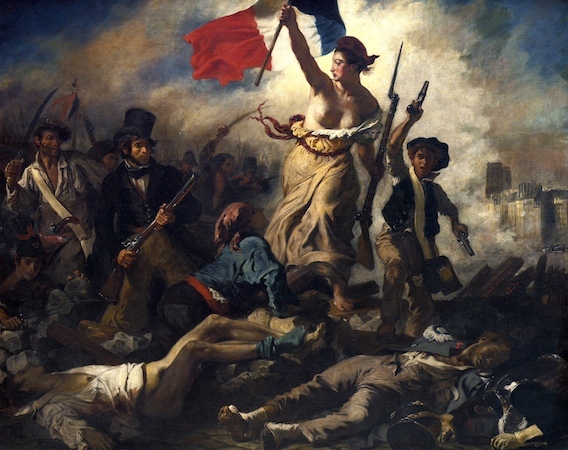 Brilliant colors and deep shadows punctuate the canvas as the powerful allegorical figure of Liberty surges forward over the hopeful and despairing figures at the barricade. 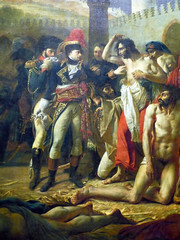 That intensity of emotion, so characteristic of French Romantic art, would be echoed if not amplified by the sculptor François Rude’s Departure of the Volunteers of 1792 (La Marseillaise) (1833-6). 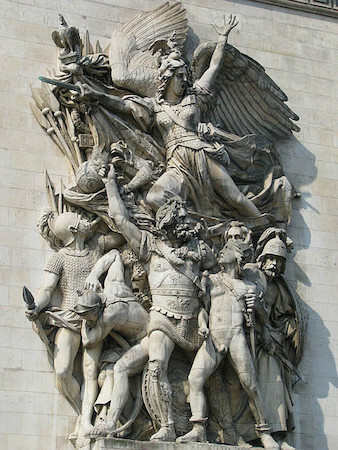 Its energetic winged figure of France/Liberty, a modern Nike, seems to scream out as she leads the native French forward to victory in one of the very few Romantic public monuments. Cite this page as: Dr. Claire Black McCoy, "Romanticism in France," in Smarthistory, September 1, 2018, accessed April 24, 2019, https://smarthistory.org/romanticism-in-france/.